After the untethered Evasi0n jailbreak was released for iOS 6 devices, we told you about a bug that was causing Apple’s stock Weather app to crash on jailbroken iPhones. On the iPad, the jailbreak was unhiding an old iPhone version of the Weather app. There was a manual way to fix the bug, but now an official patch has been released in Cydia for all devices that have been jailbroken with Evasi0n. One of the hackers behind Evasi0n tweeted the news about the patch earlier today. 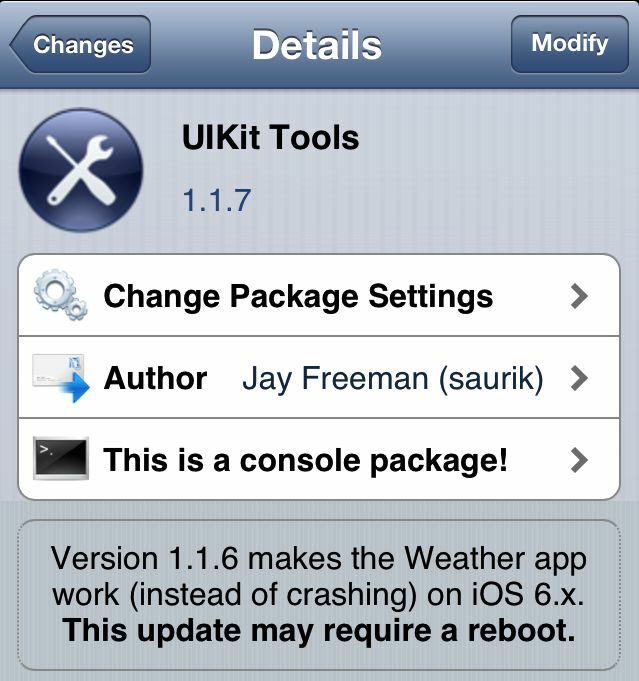 The update to UIKit Tools should be available under the “Changes” section of Cydia on your jailbroken iOS device. If you don’t see it, refresh the Changes page and it should appear. There’s also an update to the Evasi0n untether itself that fixes an issue with long reboot times.